We strive to provide a quality education which will empower our students to develop into self-confident, responsible members of a rapidly changing and increasing complex society. We will provide a safe, caring environment which will promote a generation of students that will make worthwhile contributions to their society, while maintaining the customs and beliefs of the UAE. 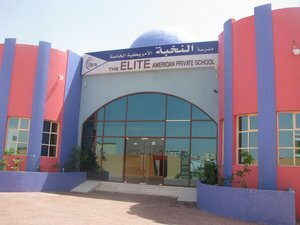 The Elite Private School will work in partnership with parents, teachers and students to educate a future generation of leaders that are well equipped to play a constructive role in society. – Faculty is role models and guides and should be qualified educators who are dedicated to promoting academic excellence. – We will provide a safe school environment that is conducive to learning. – We will relate classroom experiences to the reality of the world. – All students can learn and should be given the opportunity to do so. – Education is a partnership with parents, teachers and students. – Learning is a life-long process. – We will do ongoing evaluation of the educational programs. – We need to have high expectations of students. – Every students is an important, unique learner who is worthy of dignity as a person. – We will reach about and respect the cultural diversity and heritage of the UAE and teach the acceptance of all people. – We will instill self-confidence and independence.